Asia Pacific OBD aftermarket is estimated to register the fastest growth at a CAGR of over 20% from 2018 to 2024 due to the rapid growth in the automobile industry, particularly in China, India, and Japan. With huge investments by domestic and global auto players in the region, the market is projected to grow swiftly during the forecast timeline. 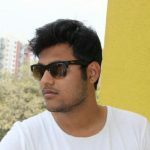 For instance, in April 2018, the Hinduja Group flagship Ashok Leyland (ALL) in India made an announcement to invest Rs 1,000 crore to revamp its capacity and launch 20 new vehicles by the end of 2018. Similarly, in July 2018, Tesla planned to open a new electric car production plant in Shanghai to produce 500,000 cars a year. Due to a speedy growth in the automobile sector, the demand for OBD devices to tackle and diagnose the faulty emission-control systems is projected to increase during the forecast period. 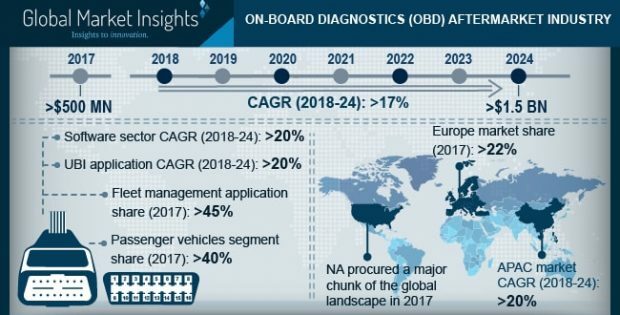 Onboard Diagnostics (OBD) aftermarket is projected to surpass USD 1.5 billion by 2024. Onboard diagnostics refers to a vehicle?s self-diagnostics and reporting capabilities. The technology facilitates the monitoring and evaluation of the vehicle?s engine and its sub-components to ensure that all components are functioning properly. Vehicle owners and the car technicians use OBD devices to gain access to a real-time status of the vehicle subsystems. A simple OBD system consists of various sensors that collect the data from various vehicle components, refine, and process this data to gain valuable insights, that further aid in the diagnosis and repair of faulty components. These systems are currently being used with telematics that enables vehicle owners to detect issues such as low performance, and heavy emissions along with the real-time driver behavior. The automotive industry uses two types of OBD hardware devices, viz., OBD scanners and OBD dongles. The scanners are more like code readers or scan tools that read codes from any vehicle equipped with OBD II. The OBD dongles are gaining more popularity among fleet managers. The dongle is a visible accessory that can be connected to the driver?s smartphone, plugged directly into the OBD II port, and can also be connected in an effortless way to a network. As these devices can be independently used and do not require any wired connection, the demand for dongles is projected to grow swiftly over the forecast timeline. The OBD aftermarket is projected to register a lucrative growth at a CAGR of over 17% between 2018 and 2024. The growth can be attributed to the factors such as an increase in vehicle production and the growing need to implement emission control norms and regulations to tackle air pollution. The significant investments made by the automotive manufacturers and the aftermarket service providers around the globe are contributing to an increasing demand for the development of connected vehicles. The rapid growth of the automobile industry has forced the manufacturers to offer more robust OBD devices, particularly for light-duty and heavy-duty vehicles. Another factor driving the growth of the OBD aftermarket is the increasing shift toward Usage-Based Insurance (UBI) to promote safer driving practices among the drivers. OBD devices help auto companies and insurance providers to set the premium amount depending on the driver?s driving habits, distance traveled, and the status of the vehicle. Based on these considerations, the insurance companies can decide whether to reward or penalize the customer. North America is estimated to account for the largest share of over 40% in the global OBD aftermarket by 2024. The market growth in this region is attributed to technological advancements in the transportation infrastructure and the high penetration of the smartphones and cloud technology in the region. The extensive presence of some of the leading global auto manufacturers and suppliers is also contributing to the growing automobile industry in the region. These players have made significant investments in their manufacturing facilities and R&D departments to develop new and advanced vehicle models. For instance, in January 2018, Ford Motor Company announced that it is planning to increase investments in electric vehicles to USD 11 billion by 2022 with 40 electric and fully-hybrid vehicles in its portfolio. The government agencies in the region have also implemented several emission standards to minimize the pollution levels and associated health hazards. For instance, in July 2018, the Indonesian Ministry of Environment and Forestry announced that car manufacturers have to comply with Euro 4 Emission Standards for all petrol-powered vehicles by September 2018 while diesel-powered vehicles will follow the standards from 2020. Also, in July 2018, the Chinese government released the China VI emission standard for heavy vehicles, which mandates Diesel Particulate Filters (DPF) on all heavy-duty vehicle models introduced after 2021. Such initiatives are expected to further facilitate the growing demand for OBD solutions in the region.